Recorded in several forms including Hothersall, Hothershall, and Huthersall, this is an English locational surname. 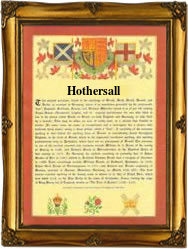 It originates from hamlet of Hothersall near Preston in Lancashire, whose population was recently given as '103'. This suggests that the place has reduced in size from its original form, probably owing to the various Enclosure Acts. This allowed landlords under the disguise of introducing improved farming methods, to seize the common grazing rights of the tenants. The people were then effectively forced off the land to seek work and homes elsewhere. Many ultimately gravitated to London as this was the only large city in the country, and the 'mecca' for most country people. In the case of this surname it appears suddenly and in some number, in the registers of the Greater London diocese from the last quarter of the 17th century. Locational surnames are often 'from' names. That is to say they are names given to people as easy identification, after they left their original homes and moved elsewhere. Spelling being at best erratic, and local accents thick, soon lead to the development of 'sounds like' spellings. The name means 'Oder's house' and is similar to Huddersfield, which was 'Oder's feld'. Early examples of the name recording include: John Hothersall of Ribcester, Lancashire, on October 7th 1623, and Meliora Hothershall, who married Richard Hallett, at St Giles Cripplegate, in the city of London, on September 9th 1695.